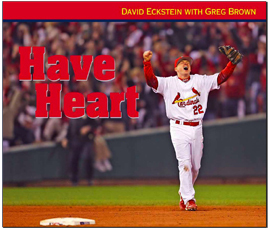 What if you could bring St.Louis Cardinal David Eckstein to your home to meet your kids! What would you want him to say? You'd want him to inspire your kids and tell personal stories about his life and the lessons he's learned. From being released by the Boston Red Sox to playing in the Worlds Series, David tells how it takes heart to get through life's ups and downs. That's exactly what this book is designed to do, give readers a pep talk on life. Have Heart allows fans and children of all ages to meet St. Louis Have_Heart Cardinal's 5'7" sparkplug shortstop in a personal way. Not only does the first-person writing make it feel like a conversation, David shares his family album of special family photos and memories. Wrapped within what made him laugh and cry is the family dynamic that shaped his world. The youngest of five children, David and his siblings were raised by educators, Pat Eckstein, an elementary school teacher, and Whitey Eckstein, a high school history teacher. The Ecksteins taught family comes first. Other rules included "always give 100 percent" and "no complaining." The family's core values were tested when two sisters and a brother suffered kidney failure. Watching his loved ones fight for their lives gave David a lasting balance of what's most important. Have Heart is an uplifting story about the courage and persistence it takes to beat the odds. It's about the heart of a strong family. It encourages all of us to find our heart.